The partners at Fritz & Perelberg were Jacob Fritz (1864?-1940) and Morris Perelberg (1872?-1939). The partnership was short-lived (approximately 1898 to 1903), although both men were involved in the iron business for many years. 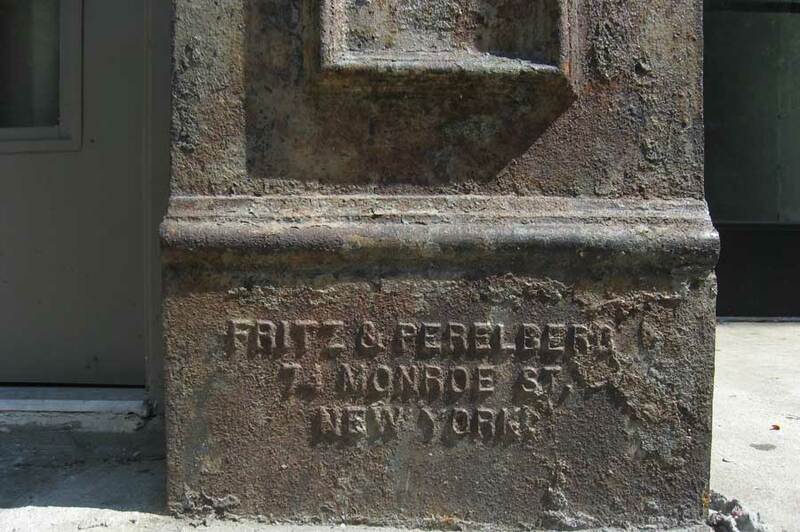 The original address of Fritz & Perelberg in 1898 was at 264 East Broadway, represented on this foundry mark at 2793 Frederick Douglass Blvd. The New York City telephone directory listed Fritz & Perelberg at 74 Monroe St. a year later in 1899. Morris Perelberg's naturalization petition filed 5 August 1899 stated that he was born 15 Sept. 1872, that his former nationality was Russian, and that he arrived at the port of New York 15 March 1888. His entry in the 1900 U. S. Census recorded his birth as May 1869, age 31. In 1910 he was 40 years old. Then in the 1920 census he was 46 years old, a widower. In 1930 he was 59 and lived on Boston Road in the Bronx with his son, Abraham, daughter, Esther, and a grandchild. Jacob Fritz first appeared in New York city directories in 1891 in business with Frank Goldstein as blacksmiths located at 21 Chrystie St. downtown on the East Side. This business was described as "fixtures" in Trow's city directories of 1893 and 1894. In 1895 Fritz, Goldstein & Co. became "Fritz, Goldstein & Masor, iron" at 61 Rutgers St.
Masor was Barnet Masor (1868-1940). More on Barnet Masor can be found on the B. Masor & Co. page.